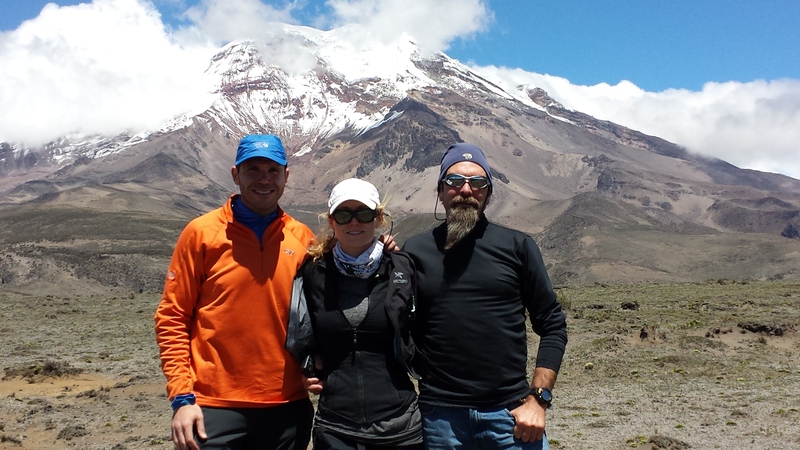 Congratulations to the Team on their summit of Chimborazo, the highest mountain in Ecuador (6,310m/20,702ft)! Hi, this is Haley, reporting for the Team. Yesterday we climbed Chimborazo, which is the tallest mountain in Ecuador, and is the highest point from the center of the Earth. This was a very hard climb, 5,000 feet vertical. We climbed all through the night while admiring beautiful stars and moon. And I’m happy to say that all of us were able to summit. Doug and Randall summited the first summit, called Veintimilla, and I decided to go a little further to the highest point on Chimborazo called the Whymper Summit. It was a clear and beautiful night, we had great views of Cotopaxi and Antisana in the distance. Ecuador is just such a beautiful place. Just a special thanks to Jose Luis, our Guide. He is an amazing person and mountaineer man. We have all learned so much from him and this experience. This will be a trip that we will always remember for a lifetime, thank you Jose Luis! Today we are headed back to Quito with a farewell dinner tonight and then we are all flying out back to the US. So to all the family back at home, we will see you soon! Bye. Team Climb For A Smile summits with beautiful clear views of Antarctica!